Highway Service Contractors | RoadSafe Traffic Systems, Inc.
RoadSafe provides temporary traffic control and protection for highway and street construction projects and commercial and residential building projects. We serve heavy highway and bridge contractors, specialty contractors in bridge painting, curb and gutter, guardrail installation, underground construction etc. and building contractors who require safety in and around their job sites. RoadSafe is often a subcontractor to general contractors who work with state departments of transportation, toll authorities, turnpikes, cities, counties and airports. 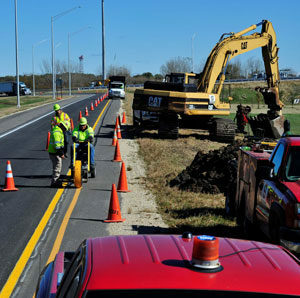 Our projects range from temporary traffic control and protection on major highway jobs to pavement marking, sign manufacturing and installation and daily equipment rentals. Our national network of branches means RoadSafe can send crews and equipment anywhere with ATSSA-trained and certified professionals to provide traffic control and pavement marking. Contact your nearest branch office to discuss your job requirements. 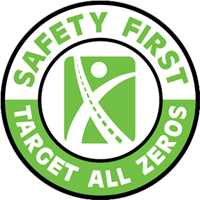 RoadSafe also offers a wide selection of work zone safety products from leading manufacturers with innovative, low-cost solutions for roadway safety. We carry a complete line of personal protective equipment including high visibility apparel, safety gloves, hearing protection, hard hats and fall protection equipment. Contact your local representative for more product information.